Spent the morning at the local farmer’s market buying lots of fresh organic produce. 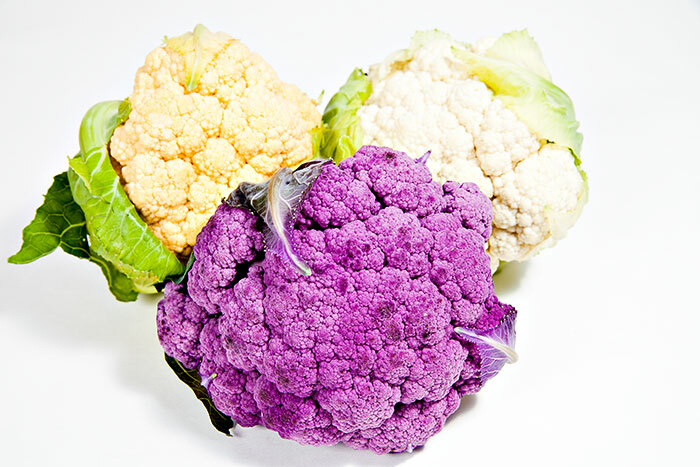 I noticed that there were 3 different types of cauliflower; purple, golden or orange and the traditional white. I have yet to find out if there is any difference in taste or whether the color is just ornamental. Cauliflower is a really healthy food. It’s high in fiber and vitamin-C. It contains several phytochemicals which have been shown to reduce the risk of cancer. In fact a diet with a high intake of cauliflower has been shown to reduce the risk of aggressive prostate cancer. I’m on a personal crusade to start eating healthier. I’ve been reading a book by Michael Pollan called Food Rules which contains 64 rules to try and follow to wean yourself off a Western style diet (lots of processed foods and meats, added sugars, fat and salt, refined grains and limited fruits and vegetables) which has been show to cause high rates of diseases like diabetes, obesity, cardiovascular disease and cancer. Avoid food products containing ingredients that no ordinary human would keep in the pantry. Avoid foods that are pretending to be something they are not. Don’t eat breakfast cereals that change the color of the milk. Eat when you are hungry, not when you are bored. The book adds brief descriptions and reasoning behind each rule. It was a really interesting book that definitely changed the way I view the food I eat. of course the author is also a realist in that no one is going to adhere to all of these rules all of the time, hence the final rule: Break the rules once in a while. If you are interested in eating healthier I would recommend reading this book. It offers up a lot of tips and information to help you make informed decisions about the food you purchase. And my personal Pollan favorite: “The whiter the bread, the sooner you’ll be dead”! Eat only whole grain breads…those using no refined flours. Same goes for rice…eat brown rice, not the nutritionally devoid white rice.